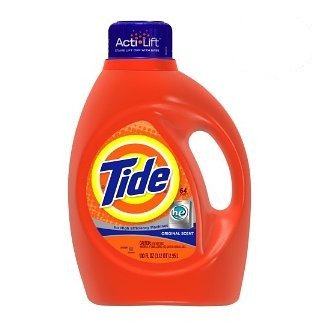 Elizabeth has provided this Tide HE detergent review, of the original scent. I have been using Tide HE laundry detergent for several years now and I would not use anything else. I have tried other brands in the past but nothing compares to Tide. Tide gets my clothes clean. I can feel the difference between clothes cleaned with a different detergent. I love the scent (I use original), because it is not heavy nor does it smell like perfume - it simply smells clean. My son always comments on how much he likes the smell of his clothes and especially his blanket, it seems to be comforting to him. For spills and stains, I just put a little Tide directly on the spot I want to treat and it is always gone after the wash. Tide now has Acti-Lift which is a stain lifting additive. Just when you think a product couldn't be improved on -- this makes Tide an even more valuable commodity -- as it protects your wardrobe investment. Our clothes are not faded or aged, Tide HE detergent keeps them looking bright and new. I even wash my infant and young son's clothes in it -- it is that gentle. It is also strong enough to wash my husband's work clothes and and my son's play clothes. I also use it to wash delicate and wool. I cannot expound on the versatility, effectiveness and overall ability of this product -- it just couldn't be better. I am also a fan of the fact that the manufacturing company for Tide, Procter & Gamble, gives back to the community through various programs and services that they offer like Loads of Hope. It's nice to know that my money is going to an incredible product whose manufacturer cares about the well being of others. 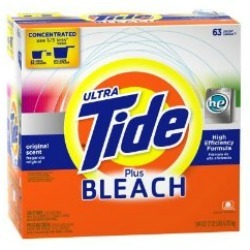 Over all Tide HE detergent in the Original scent is the only detergent for me and my family -- it's simply the BEST. Thanks Elizabeth for this Tide HE detergent review. Does anyone else have an opinion about Tide detergent? If so, please share your Tide detergent reviews here, or read other reviews already submitted. In addition, you can share other laundry detergent reviews here, telling me which one you like the best. Susie has shared her experience with Tide HE detergent, in the original scent. This product is horribly over-scented. It clings to clothes long after they are washed and the smell stays throughout everything in the home. This means the smell stays long after items are washed, dried, folded, put away, worn and put back in the laundry basket. Even the clothing dressers, closets and rooms have this cloying smell. Oh, yes, sneezing. And no, I'm not buying another P&G laundry detergent for a long, long, time. Susie, thanks for sharing your opinion of this detergent. I actually know what you mean. Some people think that the scent in a detergent is a major attraction, and it factors highly into their decision. However, for those of us who suffer from laundry detergent allergies scent (and other factors, like dyes in detergents) can be a major detractor instead. I often discuss symptoms of detergent allergies, and these generally focus on those things really noticeable to people, like itching, hives, or rashes, but another very common symptom is sneezing, and that is no fun either. Susie, I don't like lots of smell either in my detergents. Therefore, I've compiled a list of hypoallergenic laundry detergent choices you can choose from, if you want to find something non-scented. I will say that Tide Free & Gentle detergent works quite well (but many lower cost scent free detergents also work well too). Has anyone else used Tide HE detergent, or any other version of Tide and wish to share a review. If so, you can share your review here, or read other reviews of other versions already submitted. In addition, you can share what you believe is the best laundry detergent here, telling me why you like it so much. Heidi has shared her Tide HE powder with bleach alternative review. She explained in another review how she typically uses Fab laundry detergent, except on heavily stained and soiled items. When I asked her what she uses for these really dirty clothes, she shared this review with me. If the clothes are really bad I use Tide HE powder with color safe bleach. It usually gets everything out, but I do have spray pretreaters here I use if it is particularly tough. I stick with powders. They are usually more economical where I live and help prevent mold in the front load door gaskets. I just collect the coupons and wait for a sale. I do have to keep hypoallergenic detergent on hand for our unmentionables due to detergent allergies, so I'll review some of those too. Thanks Heidi for sharing all these reviews with me! I really appreciate it. I know many people (including the reviewer above) swear by using Tide, saying it is the best way for them to remove stains, even though it is one of the most expensive brands. I think your balancing of the need for an excellent detergent for stain removal (Tide) with cost (using Fab laundry detergent for most normal, lightly soiled loads), is a great cost savings strategy. I'm curious, do any other readers do this for their laundry? If so, what products do you use, or do you stick with one detergent all the time, no matter the cost or stain on the item? You can share your laundry detergent review here for this, or another brand, sharing what you like, or don't, about the detergent, and why. In addition, you can share your own Tide detergent review here, or read other reviews of the many other types, scents and varieties also available where I've already received reviews. Please note that Heidi has also shared a couple of other reviews. You can also read her Downy with scent pearls review here.